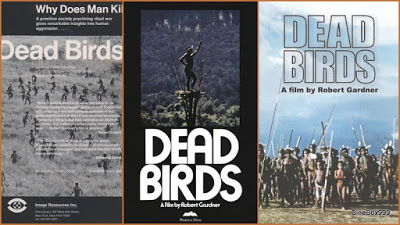 Dead Birds is a 1963 documentary film by Robert Gardner about the Dani people of New Guinea. 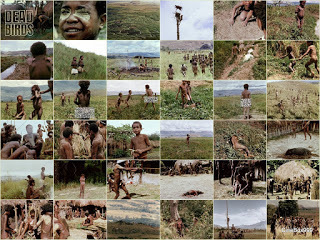 It was produced as part of the Harvard-Peabody Expedition to study the highlands of New Guinea, at that time one of the few remaining areas in the world uncolonized by Europeans. The premiere of Dead Birds took place at the Loeb Drama Center at Harvard University in October 1963. In 1998, this film was selected for preservation in the United States National Film Registry by the Library of Congress as being "culturally, historically, or aesthetically significant". DEAD BIRDS is a film about the Dani, a people dwelling in the Grand Valley of the Baliem high in the mountains of West Irian. When I shot the film in 1961, the Dani had an almost classic Neolithic culture. They were exceptional in the way they focussed their energies and based their values on an elaborate system of intertribal warfare and revenge. Neighboring groups of Dani clans, separated by uncultivated strips of no man's land, engaged in frequent formal battles. When a warrior was killed in battle or died from a wound and even when a woman or a child lost their life in an enemy raid, the victors celebrated and the victims mourned. Because each death had to be avenged, the balance was continually being adjusted with the spirits of the aggrieved lifted and the ghosts of slain comrades satisfied as soon as a compensating enemy life was taken. There was no thought in the Dani world of wars ever ending, unless it rained or became dark. Without war there would be no way to satisfy the ghosts. Wars were also the best way they knew to keep a terrible harmony in a life which would be, without the strife they invented, mostly hard and dull. DEAD BIRDS has a meaning which is both immediate and allegorical. In the Dani language it refers to the weapons and ornaments recovered in battle. Its other more poetic meaning comes from the Dani belief that people, because they are like birds, must die. In making DEAD BIRDS certain kinds of behavior were followed, never directed. It was an attempt to see people from within and to wonder, when the selected fragments of that life were assembled, if they might speak not only of the Dani but also of ourselves. - Robert Gardner.